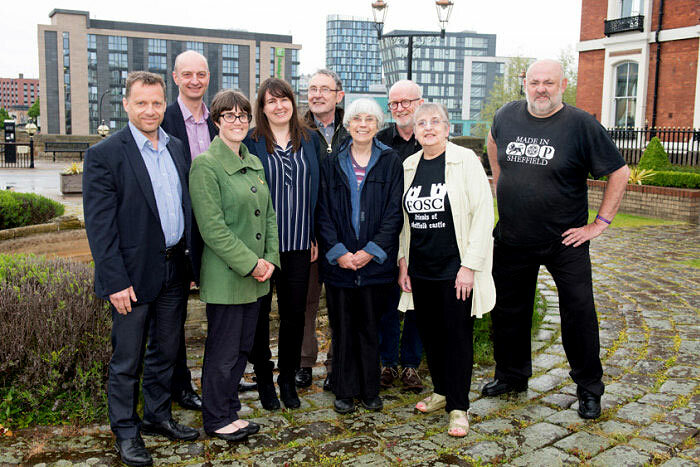 The Friends of Sheffield Castle is a voluntary group that aims to protect and promote the archaeological site of Sheffield Castle for the benefit of the people of Sheffield and surrounding areas and for future generations. We will acquire and disseminate information about Sheffield Castle at local and national levels, and will work with local, regional and national organisations in order to protect and promote the remains of Sheffield Castle. We are looking to increase our Membership and warmly welcome applications from Individuals (£5 per annum) or Organisations (£25 per annum) either online via this site or via hard copy application forms available at FOSC meetings and events. Our Management Committee comprises people from a variety of backgrounds whose skills are offered to the Group on a voluntary basis. Martin Gorman has been Chair of FoSC for the past 2 years. Lived and worked in Sheffield all his life, working for NatWest as Relationship Director and having a large network of Commercial and Financial contacts in the area. Also fulfils role as Sheffield Chamber of Commerce, Council Member. Holly Smith joined FOSC committee in 2015 and was elected as secretary in 2016. Holly lives and works in Sheffield and is both regional manager and the environment team leader at Sheffield-based environmental consultancy Ecus Ltd. Her technical background is environmental impact assessment, with a particular focus on ecology. Her academic background is biology with a PhD focussing on botany and climate change. Glynis Jones is Treasurer for the Group. She is a Professor in the Archaeology Department at the University of Sheffield. Also Secretary for the Friends of Porter Valley who organise the famous Charity Duck Race in Endcliffe Park. John Baker is chair of The Time Travellers, an active amateur archaeology group covering South Yorkshire and N E Derbyshire, who are currently running a Heritage Lottery funded excavation on a Roman Site at Whirlow Farm. John is Membership Secretary for FoSC. Clive Waddington Sheffielder, is the Managing Director of Archaeological Research Services Ltd, a national archaeological consultancy and contracting company based in Bakewell and Sheffield. Clive has helped obtain funding totalling several million pounds for community archaeology projects throughout the UK and has delivered many flagship projects that have appeared on national television. He has written, co-authored and edited 14 books and lives in south-west Sheffield. Ron Clayton is a long term campaigner for the cause of Sheffield Heritage and local media commentator. Author of 3 books on Sheffield History and holding an Honours Degree in History from the University Of Sheffield. Ron hosts entertaining history walks and talks around Sheffield. Marie Gilman is a retired Secretary, College Lecturer and Office Manager. She is a committee member of 3 historical groups, speaker finder for the Sheffield Branch of the Association of Secretaries, and runs an independent business. Marie concentrates on staging public events for the Group with a view to boosting membership and awareness of Sheffield Castle. world-wide sales into the millions. A former professional musician he still performs solo ambient guitar concerts. Nick has an Honours degree in Communication Studies. Hermann Beck is managing director of Holiday Inn Royal Victoria Hotel, Sheffield and was previously President of the Sheffield Chamber of Commerce in 2009. David Clarke is a senior lecturer in journalism at Sheffield Hallam University. Lived and studied in the City gaining degrees in Archaeology, Prehistory, Medieval History and Folklore. Previously worked for Sheffield Star and Yorkshire Post as crime writer and investigative journalist.